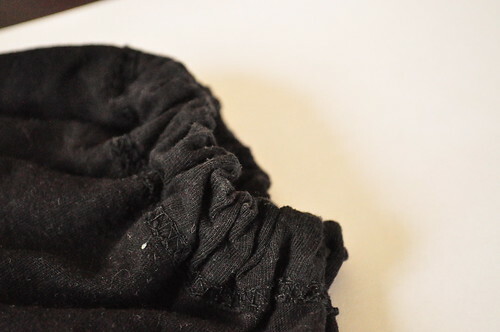 This is technically not really an apron more a general cover-up, but it's a 5 minute T-shirt recycling project that will keep your toddler's clothes clean from glitter, glue and paint! It could be the perfect (and way cheapest!) solution for a playgroup, Preschool, Sunday school or any other toddler (group) doing crafts. I know there are really cute crafts apron pattern out there and also tons of cute fabric, but really how much time and money does one invest in something that will only get dirty and spilled on, especially if you have to make 20 or more? 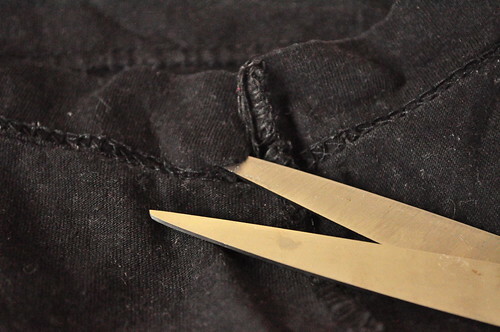 You'll also need a pair of scissors, 2 safety pins and a few minutes of your time. 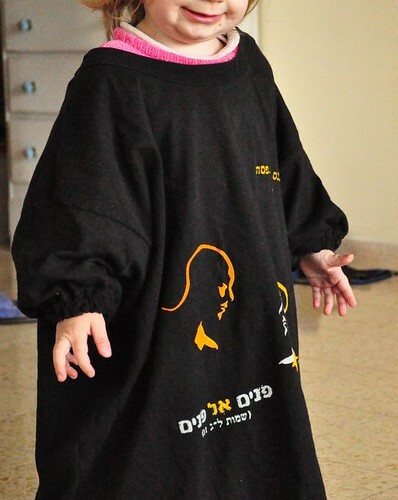 First get your toddler and hold the T-shirt up on him/her to check if the size is good. 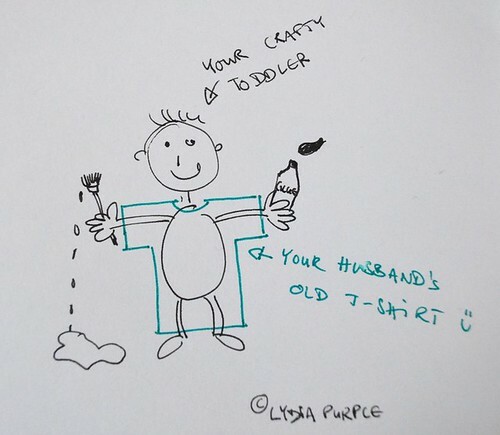 The T-shirt's width from sleeve to sleeve is about the same as your toddler's wrist to wrist measurement. Most likely a M or L will fit any toddler, XL will probably be to big and you'd have to sew the sleeve a bit shorter but I won't go into that here. Turn the T-shirt inside out. Find where the seam meets the hem on the sleeve. We'll use the folded hem as casing for the elastic. 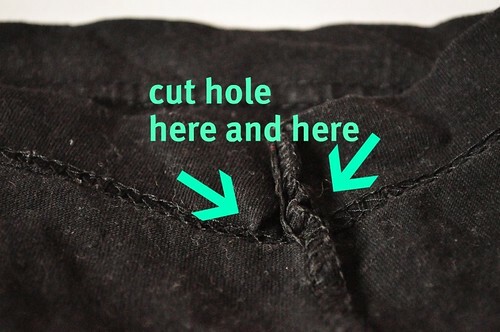 To do this you have to cut 2 small holes through the inner layer of fabric (the folded bit on the hem), one hole on each side of the seams, but make sure not to cut the seams open. (see pictures below for clarity). 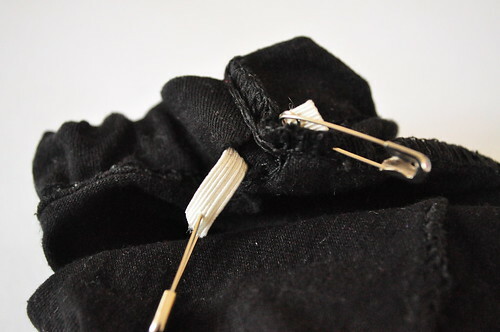 Pin one end of the elastic to the sleeve using a safety pin. 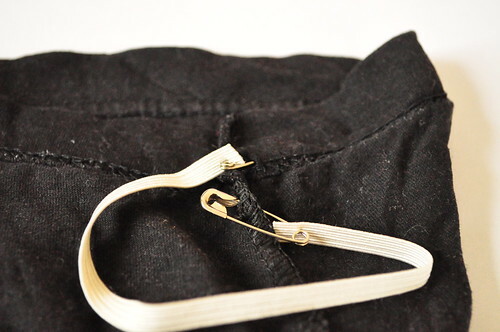 Attach the second safety pin to the other end of the elastic and insert into the casing, all the way through. The sleeve will start gathering up a lot, that's why we pinned the one end down so it won't slip through. Repeat on second sleeve. Turn the shirt right side out and put on your toddler to see if it fits. The sleeves should be snug around the wrist protecting any other shirt underneath from getting all dirty. 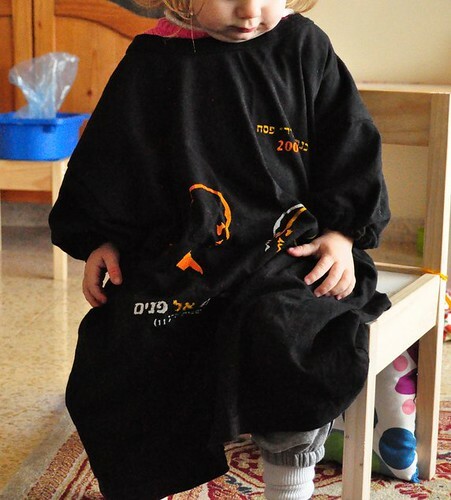 The shirt will be pretty long on the toddler, protecting his/her pants, knee-length is the best, protecting most of the clothes but not getting in the way of the little feet. Most likely you can just leave the shirt as is, but if it's way to long cut off a bit from the bottom. And you're done!